How times have changed, I swiftly realised all those years ago that although my Optonics were good there was a better player on the bank in the form of an Optinic modified by Del Romag. Sadly even though I coveted a set of Delkim modified Optonics more than was healthy I never got a set. Now as an adult I decided to put that right. Delkim, due to patent issues, no longer modifies Optonics and indeed the Optonic brand has all but died, however they do make their own alarms. I decided that I had to have a some. I bought the middle of the range the Standard Plus, the main difference between the Standard plus and TXi is that the TXi have a built in transmitter for the wireless sounderbox where as the Standard Plus’s lack this and you have to buy the add on unit to give this functionality. If I was going to buy again I would stringly suggest buying the TXi’s as to buy the Standard plus and then the micro transmitter is very expensive and in my eyes not worth it at all. The 1st thing you notice about the Delkim is its size, in a world with ATTX’s and Fox microns these alarms are really in the older school where size = reliability. That being said they do have rather satisfying feel about them and you get the impression that should a nuclear war break out the only thing to survive will be, rats, cockroaches, your solar pod and these. Some of the nicest features are immediate as soon as you look at the alarm. From the front you can see the 2 position onn / off switch ( controlling master sensitivity) and the 3 large dials that control, sensitivity, volume and tone. There is also a coloured button that indicated the colour of the LED but also controls features such as LED brightness and night mode. It really is worth looking at the manual for these devices as there is a myriad of settings from night marking ( 2 presses) to how to turn down the brightness of the LED’s ( 4 presses) all on that 1 button. The unit also comes with a remote sounderbox, which apart from being slightly too thick to fit in a pocket works well and does not eat batteries at all. The sounder box only has and on / off, volume and initial settings button. The rest is controlled by the heads ie if you change the tone on the heads the tone emitted by the sounder also changes. One change I would make to this if I was redesigning it would be to make the receiver more like a “candy bar” phone and able to fit into a pocket. The current design is just a little bit too think but apart from that is fine. So how do they work ? well surprisingly well. One massive advantage that they have over conventional bite alarms is that they do not rely on line passing over a wheel but on the subtle vibration of the line over a sensor mounded in the to of the alarm. This means that the alarm can be set of sensitive enough to detect the cough of a sparrow 200m away to only alerting of 6 inches of line is pulled off. On area where Delkims get a bad rap is that may users don’t know this and set them so sensitive that an angler merely breathing causes them to sound as if a full blooded run. Remember kids, that little piece of paper written by the spanish guy called ” Manuel” is there to guide you. Please for the sake of all of us turn down the sensitivity. 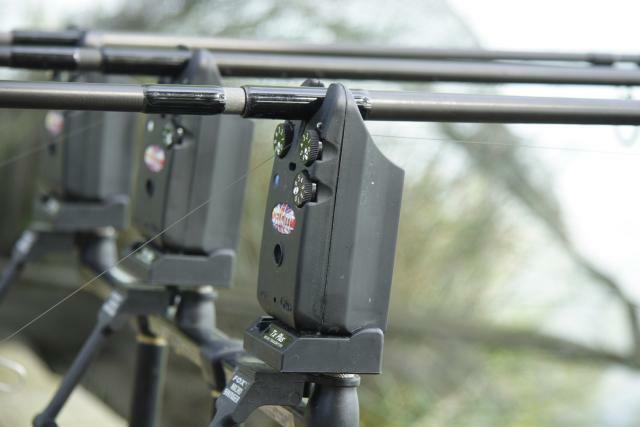 Due to the above the alarms are very well sealed and whilst not 100% water tight I have never had an issue and I have fished with them in all conditions from baking sun, to monsoon to -8 deg C and they always worked. Overall they are not the cheapest of alarms but they ooze quality and I cant see myself replacing them any time soon. If you do buy a set however buy the TXi Plus as it is cheaper in the long run. A great article mate. I’m in the market for a set myself, to upgrade from my current Fox Microns. But I’m pretty confused as to which Delkim to shop for, I’ve had a lot of conflicting advice. Several people have said “don’t buy the new ones, get the originals”, but I’m still not clear on why that is? The TXi’s seem to have all the ‘bells and whistles’ you could every possibly want in an alarm, but its just the price of them that is a big factor in my decision. well I have one of the “old” ones as well. I think people think that the new ones are not as reliable however I have not found this to be true. These alarms have lasted me for 2-3 years now and they have been rock solid all that time. I would go for the TXi’s and a sounderbox and you will not look back. Remember that if you do go for the “old” ones the sounderboxes are not compatible, I learned that thinking that I could link my “old” one into the new sounderbox.